The Philadelphia Eagles will celebrate their first Super Bowl win in franchise history with a parade Thursday. 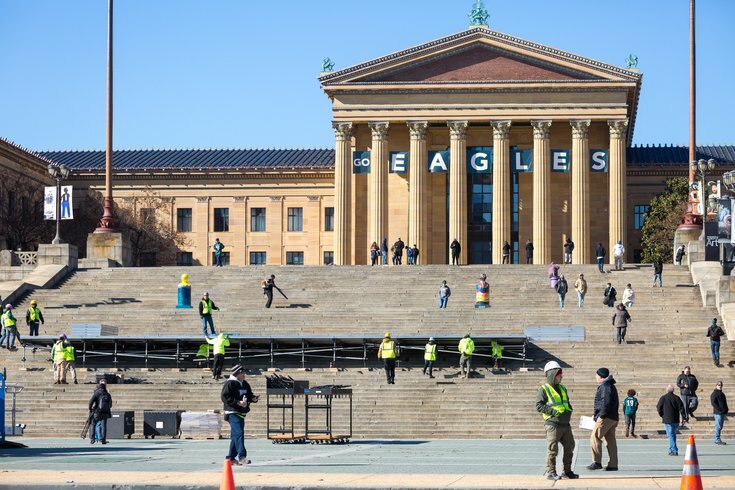 Mayor Jim Kenney's office said in a statement the parade will "tentatively" start near Broad Street and Pattison Avenue at 11 a.m., and will head north to the Philadelphia Museum of Art. Though the exact details have not been released, presumably the route would head north on South Broad Street toward City Hall before making its way to the Ben Franklin Parkway and the art museum. On Monday afternoon, crews had begun constructing a stage on the art museum's steps. More specific information will be announced at a news conference at 9 a.m. Tuesday. Several factors are being taken into consideration in choosing the day, Kenney said earlier Monday in an interview on SportsRadio WIP, including the weather forecast. A wintry mix of snow, ice and rain are predicted for Wednesday. 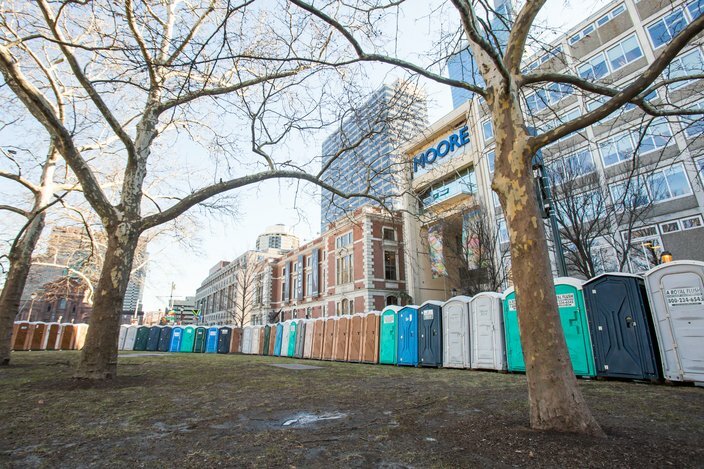 Dozens of portable toilets line the perimeter of Aviator Park near Logan Square in preparation for the Eagles' parade. The mayor said there hadn't been too many issues when the city celebrated Sunday night. There were three arrests, but that number wasn't confirmed, he said. In a statement after the big win, Kenney said the team has brought "tremendous joy" to the city. "To the fans: I have long felt that our city's professional and collegiate sports teams bring Philadelphians together, regardless of race, income, neighborhood or gender, and that was never more true than during the Eagles' brilliant season," Kenney said. 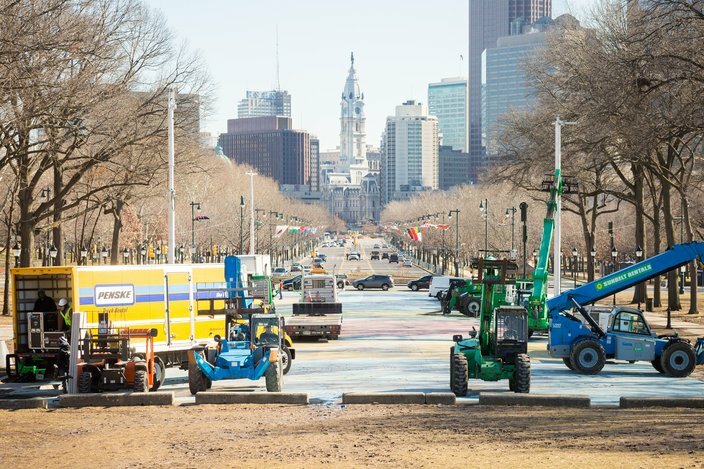 The Benjamin Franklin Parkway is prepared on Monday for the Eagles' parade which will take place on Thursday, Feb. 8, 2018. "We know you have waited years, some for decades, for the chance to crown your Birds as champs." Tuesday night: Chance of freezing rain, mainly after 4 a.m. Breezy, clouds increasing and low temperature around 28. Wednesday: Snow and freezing rain early becoming a wintry mix around 11 a.m. before changing to rain by noon. Snow and sleet accumulation of about 1 inch possible. Chance of precipitation is 90 percent. High temperature of 42. Wednesday night: Rain expected to continue until about 3 a.m. Low temperature of 31. Thursday: Mostly sunny. High near 34. Additional details about the Eagles parade, including the date, parade route and latest weather will be published here as they become available.